Reading The First Fifteen Lives of Harry August got me hooked into Claire North's (also known as Kate Griffin and Catherine Webb) wonderfully rich, clever and entertaining stories. As such I've been eagerly awaiting The Sudden Appearance of Hope for some time. One of the things that really draws you into the authors works is the idea, with Harry August it was this select group of people who exist in a loop, repeating their life over and over again. This time the bright idea deals with memory. Hope Arden isn't just a forgettable person in the normal sense, everyone forgets her completely the moment she is out of their sight. That includes family, friends and even people of authority. Chat to her one minute, turn around and when they turn back she is a stranger. To begin with this sounds kind of fun and alluring from an escapism perspective. Think about it a bit more though and many of the things that we take for granted could never be kept. Friendship is a big one of course, how do you make friends with someone who will forget you the following day? Career, how do you have a reliable career if when you turn up for work on the second day no-one remembers you working there, not to mention how you can get any real training when the course tutor forgets who you are. North explores the idea of the forgotten person in great detail, narrated from the mouth of Hope herself. Along with this story of forgetfulness we have this strange app called Perfection. Perfection is a lifestyle app on steriods, it hooks into every part of your life and then begins to shape who you are to fit what it considers to be a "better" (or Perfect) person. As you can imagine these sorts of things are never going to end well. It's a brilliantly executed story but one of the authors real gifts is how she manages to present what are essentially big science fiction ideas in what is regarded as a literary novel. She manages to sneak past plonking the book in the science fiction section and so opening up the readership to a much bigger audience. North's writing is so easy to read, there isn't lengthy exposition or pace busting world-building, her stories are focused on the idea and just as importantly the character. The character of Hope is wonderfully nuianced. She makes realistic decisions when events transpire against her and she is an open book as far as her motivations and feelings are concerned. We learn the hurt she feels being disconnected with her family and the pain of being unable to make friends, or even a lover. It's fiction that really does tug at your emotions and it's almost impossible not to be drawn in and to root for Hope. 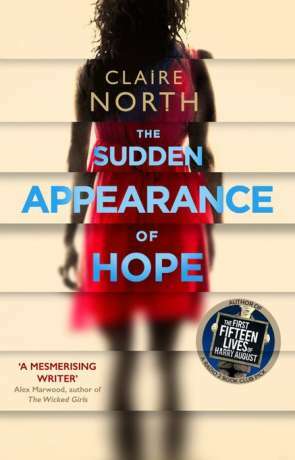 The Sudden Appearance of Hope is a clever, thought-provoking and highly entertaining story from beginning to end. It's moving, joyful fiction that cries out to be enjoyed, studied and awarded. PS: If like me these books have made you a fan of Claire North, you should also check out her work as Kate Griffin - especially the Mathhew Swift series - it's exceptional urban fantasy. Written on 27th June 2016 by Ant.